25/1 Sky Bet boosted Half-Time Accumulator Lands! What an incredible week it’s been for our tipsters! First we landed a clean sweep on the NBA on Monday for £123. We followed that up on Wednesday with a nice 15/2 Both Teams To Score accumulator win for £75 profit! On Friday night we absolutely crushed the pre-match tips, landing a 10/1 International Acca before landing a huge 40/1 NBA accumulator overnight! Today we topped it all off with a 25/1 Half-time accumulator, courtesy of a price boost from Sky Bet! You can get a free £10 bet with no deposit required! Click here to sign up! You can find all our free football tips on the football tips section of our website. Just click on the link to see the tips now! 25/1 Half Time Accumulator win! 6 goals in 30 minutes made up the 25/1 winner today! 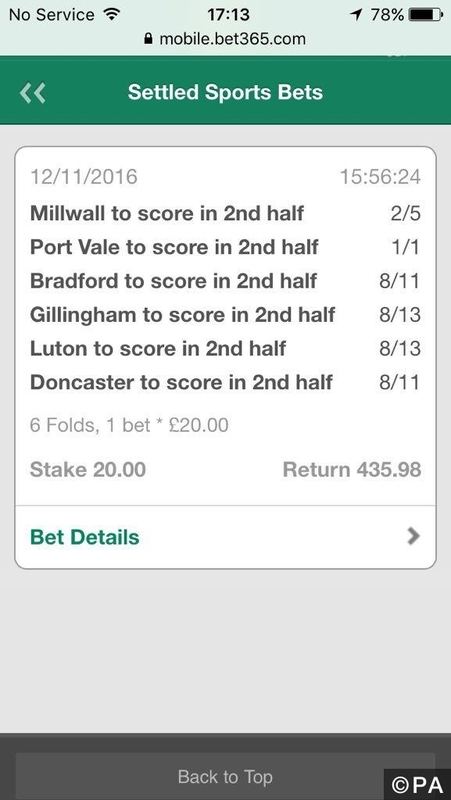 We needed Millwall, Port Vale, Bradford, Gillingham, Luton and Doncaster to score in the 2nd half to win the bet. Gillingham were the first team to net, scoring only 3 minutes in to the second half, setting the tone for things to come. We hit a slight dry patch for 10 minutes, before Bradford popped up with a goal to make it 3-0 in their match against Rochdale, making them the 2nd team ticked off for our acca. The goals started coming in thick and fast after this, with Shaun Williams netting for Millwall on 64 minutes. This was the 2nd goal in a 4-0 drubbing of 10 man Bristol Rovers. We had no goals for another 10 minutes, which left everyone slightly nervy about whether or not the bet would land, but Port Vale were on hand to deliver us a confidence boost in the form of a goal on 75 minutes, leaving just Luton to score for the boom. And score they did. Only a few minutes later, Luton netted thanks to a 75th minute Cameron McGeehan goal to secure our followers a huge £250 profit from a £10 stake! It wasn’t just the Half-Time acca that landed, as the Daily Double also landed thanks to a 98th minute Shrewsbury goal! An all around great day for the FST tipsters! As always we love to see our followers bash the bookies, so it’s to our great delight to see a wave of betslips come in through our twitter page. Categories: Blog, Inplay Betting, and Tip Results. Sports: Football.